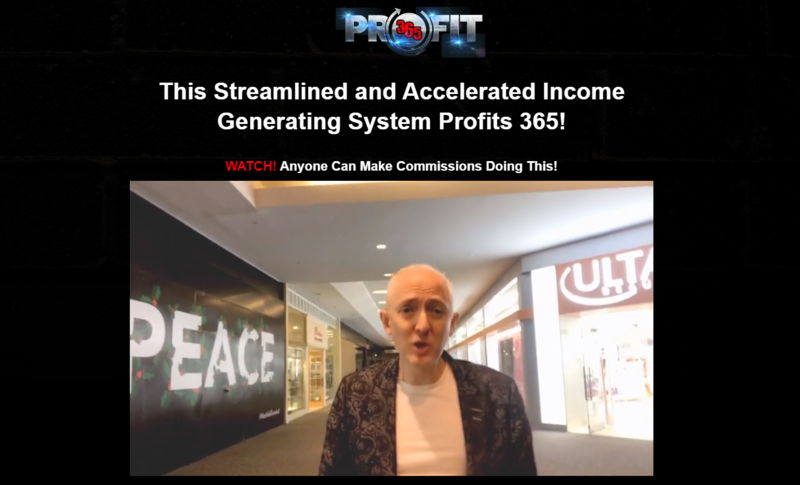 Category Archives for "Marketing Systems"
Profit 365 is a new system that was recently released by Jamie Lewis which he says you can make up to $2800 a day with. But is this actually true? Is this a realistic statement or is Profit 365 another scam you probably be avoiding? Well… Let’s just say that it is a darn good thing you came across my review here because this system is not nearly as incredible as it is claimed to be. The promotional video with Jamie Lewis starts out like a pretty typical get-rich-quick scheme, at least in my opinion. He is constantly showing off all the money he is making online and even films some ridiculous video of him going up to people in the mall telling them to just go out and create a ClickBank account so that they can “change the world” by blasting out links to the masses. They probably had no idea they would be featured in such a scammy video. Nearly half the video presentation is just him showing off all of his accounts and all of the money he makes. So it’s no wonder why you were suspicious and decided to do a little bit of extra research… It sure as heck seems it could very well be another scam right off the bat. But anyways… Let’s get into the review. I first went to make it clear that this is a review for the Profit 365 system by Jamie Lewis. There are others out there with the same name and that is why I am telling you this. In a nutshell, the system is designed to be easy for people to make money online. Basically Jamie provide you with campaigns he has used successfully in the past and tells you exactly what to do. A lot of it is “done for you” and requires little to no work. Sounds awesome, but of course this definitely doesn’t mean it is going to work out well. If you have read previous reviews I have written on products this guy has released, you probably know I’m not the biggest fan. Why not? Well… Because this guy loves to over-hype his systems and really show off his life of luxury. Also, he seems to be way more focused at pushing out products as fast as possible so that you can make as much money as possible, rather than really putting all his effort into putting out great quality products where he provides great quality support. You will be making money doing what is called affiliate marketing, which is a judgment business model that I actually have been doing online since 2015 and have had great success with. Basically this is where you promote someone else’s products and earn commissions when you help make sales. The focus here is on promoting ClickBank products via paid traffic, specifically solo ads, which he will provide you with pre-made email swipes for. All you have 2 do is log into your account and use his pre-made swipes. Solo ads or when you pay some with an email list to blast out a promotion to their last. So basically what you will be doing is using the swipes that he provide you with and paying to have them sent out to large lists of people via email. And all these emails will be writing ClickBank products which will hopefully make you money. Do you need any of these other products? Well… Let’s just say that I am not going to be recommending them. The first problem I foresee is that this is just too darn easy. There are too many “done for you” aspects of the system and because of this you don’t really learn much of anything. That means you are 100% reliant on the system and not going to be building a sustainable online business for yourself. And these are the exact types of systems that Jamie is famous for… They lure in the people looking for ways to” get-rich-quick”, which never really and very well. I also don’t like the fact that you will be promoting ClickBank products, which are often very low quality and many times “scammy”. Sure, you can use his methods to promote some decent products, but much of what you will be doing is certainly not going to “change the world”, if anything it is going to leave the world feeling a little bit ripped off with the low quality products they were just suckered into buying. Something else that he definitely does not tell you is that this is NOT going to work out as well as it seems. Just think about it… Everyone is going to be sending out the same darn email swipes. This type of thing gets old real fast and market saturation is a serious concern. If you do the same thing over and over again, eventually starts to get worn out. If everyone is sending out the same emails they are not going to work near as good and this is always the case with these types of systems. And of course I just don’t like how over-hyped this system is. It makes you believe that you’re going to be striking it rich… Making up to $2800 a day. That is very unrealistic and you should not expect to earn anywhere even relatively close to that amount. As I said, this guy is famous for these types of over-hyped systems that get you really excited but usually are a letdown. I wouldn’t call this system a scam, but I’m also not going to be recommending it because I do not consider it to be very good quality, nor do I think it is going to work out well. I have reviewed tons of scams over the years and systems that just aren’t that great, and this falls into the category of “not being that great”. While it is definitely possible to make money with the system, I just don’t think it is worth the time nor the effort. If you want to build a real online income for yourself, and not just be 100% reliant on some system that is going to last forever, and I highly suggest taking a look at this guide I put together that shows exactly how I went from $0 to over $6000 a month online. 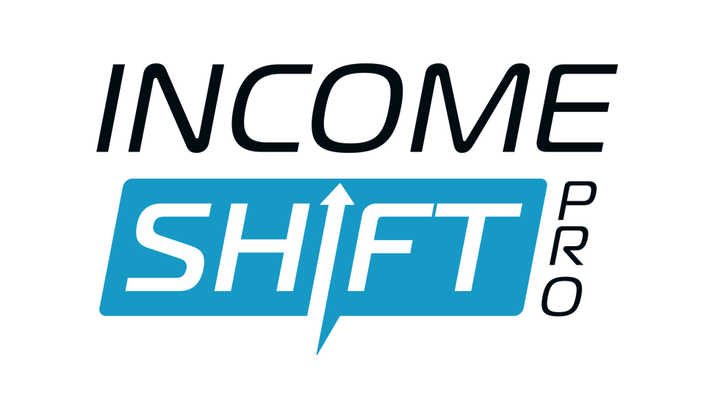 Welcome to my review of Income Shift Pro. Are you wondering what Income Shift Pro is all about, whether or not it is worth buying into, or maybe even is Income Shift Pro a scam? Well then you want to read my review. This opportunity is often promoted in a way that makes it seem better than it really is… Which is the point of me writing this review now. The goal here is to give you a more realistic overview of what exactly this system is and whether or not it is right for you, so that you can make a more informed decision before deciding to go through and purchase it or not. And by the way, I am not affiliated with this system in any way, so you can expect an unbiased review. I'll be going over the goods and the bads of it all. What Is My Income Shift Pro? What The Heck Is myEcon? Is Income Shift Pro Worth The Price? Is This Something I'd Recommend? 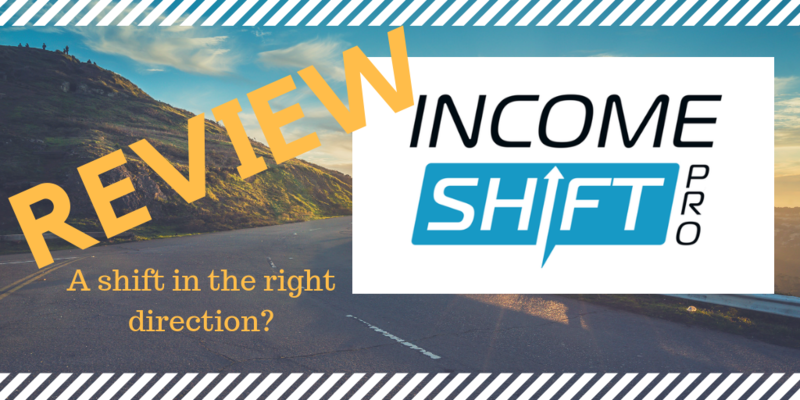 I'm not sure what you already know about Income Shift Pro so I'll be starting off with a high level overview. The real money making opportunity here is myEcon and ISP just helps you promote the opportunity better and more easily so that you can make more money. The marketing system was actually created by associates of myEcon which is a good sign because the people who created it are also using it. Overall I do believe that ISP can be well worth the money, at only $25 per month. That said, this is still not something I would recommend for everyone as I will get into later in this review. 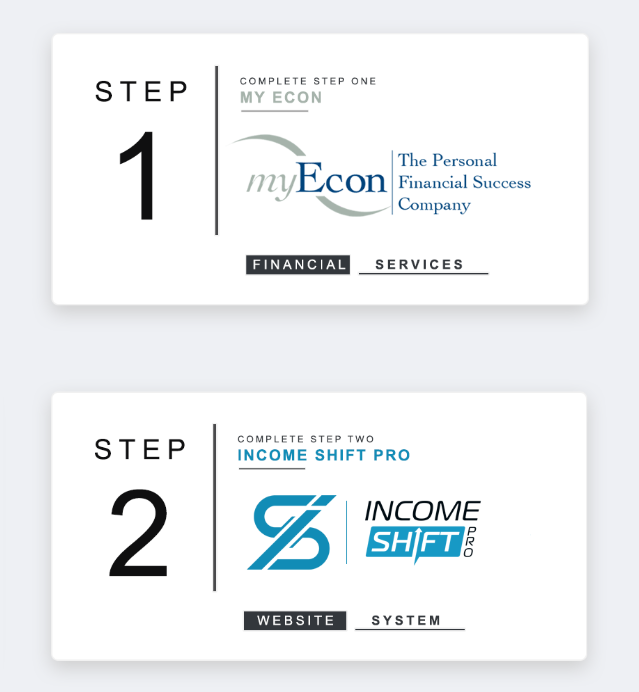 I want to make it very clear that there is a good chance making money with Income Shift Pro, or maybe I should say myEcon along with the aid of Income Shift Pro, is not as easy as you have been led to believe. I've seen promotions telling you that if you have a computer, smart phone or tablet, and Internet connection, then you can make money with this opportunity. This leads you to believe that it is incredibly easy and that just about anybody could do it. I mean, based on some of what you are told you would be led to believe that an eight-year-old can do it… Which is simply not true. While you can make money with this, and some people make a heck of a lot, this is definitely a lot harder than some of the misleading promotions tell you. Before I get into all of this, I just want to make it very clear that you do not actually need ISP to make money with myEcon. As stated, this is simply a marketing system that helps you make money with it, but is not absolutely necessary and many people probably don't even use it. When you purchase your $25 per month membership you will get access to pre-made landing pages for promoting myEcon, a place where you can store your leads and manage them, different tools that make it easy to follow up with your leads, and some training. Below you can see a screenshot of what it looks like inside the dashboard. What you are seeing here is a bunch of pre-made landing pages for promoting the opportunity. These pages are very professional looking and I don't see any reason why they wouldn't be effective. There is no doubt that using landing pages like this would increase your chances of promoting this opportunity successfully compared to just posting direct links to myEcon around social media and stuff. The lead storage manager allows you to check on your leads and you can also choose to export them if you want to maybe move them to another marketing system or do something along those lines. What these tools allow you to do is easily blast out tons of emails or SMS messages to your leads along with the ability to set up autoresponder campaigns, via email or SMS, and of course you have the statistics and tracking to make sure you are on the right path. For the email autoresponder, they also have pre-written messages that you can follow up on your leads with, making things a little bit easier for the beginner. When it comes to the training, there isn't much to say. This is where ISP is lacking big time in my opinion. There is training on setting up the marketing system, testing your sales funnel, integrating third-party autoresponders, getting your domain set up and more… But nothing on traffic generation here, which is where it is lacking. However, you will have the ability to get some training in the private Facebook group that I will discuss later in this review. If you don't already know what myEcon it is, then you're probably really wondering about it. After all, this is the real money making opportunity here and ISP just helps you promote it in order to make money. Maybe I should have covered this first, but there is a lot going on here and I didn't really know where to include the section. Anyhow, I'm going to try to make this short and compact as I can, but I do have to do a good bit of explaining because this is very important. myEcon (located at myEcon.net) is a MLM business that sells a wide variety of products, mostly dealing with finances. What the heck is a MLM? A MLM, which stands for multilevel marketing, is a business that has a pyramid-like structure and relies heavily on recruitment of new members, which is why so many people call MLM's pyramid schemes. While MLM businesses do sell products to the general public, they are most known for their business opportunities that you are able to join and then make money with by either selling products or recruiting other people into the business. The products that are in this place is lineup include the following. They are all third-party products as far as I know, which really makes me question things. It appears that this MLM business was largely created for the "business opportunity" part and not so much for the actual selling a product to the general public. This seems to be placed more on the back burner, which is why almost every formation you find online for myEcon is about the business opportunity. But anyways, here's a list and some details of the different products they sell… And by the way, as an associate (which is what you are called when you join the business opportunity) you will have access to all of these different products without paying the additional price. Provides ID protection services as well as ID restoration if you would need it. Helps you better your credit. System that stores your transactions to help you manage your money. Makes things easier for you by automatically capturing online receipts. Roadside assistance service. Provides towing, battery jumpstart, flat tire change, lockout and more. Have their own cashback program where you can get cashback on online purchases. If you are familiar with the BeFrugal or Ibotta cashback programs then you know how these things work. Just sends you over to Priceline.com. Not much to say here... they sell coffee. Health products. As I'm writing this they are selling a product called MSM and Daily Ultimate. The compensation plan is where it's at. Sure, the products can be useful and of benefit to many people. I mean who doesn't benefit from a nice cup of coffee on a Wednesday morning? But the business opportunities the main focus here. In fact, it seems that the overwhelming majority of people that have anything to do with myEcon are just trying to make money with the business opportunity and don't really give a crap about the products. The compensation plan is all about moving up the different ranks within the business, which in turn unlock more and more of the compensation plan and allow you to earn more and more money. In order to start out this business it will cost you $34.95 for the monthly membership. As a MD you will be able to get 15% CV (Commissionable Volume). CV is just a dollar amount that is assigned to each product that is sold by myEcon and is used to calculate commissions. This sort of thing is typical of all MLM's. When you recruit in two new MD's you will get $10 commissions for each, and this will be the up to the rank of EVP (Executive Vice President). Besides recruiting in 2 new MDs, you can also sell $200 worth of CV on your own to make it to this rank. As an EVP you will be able to create what are called "baseshops", which start with your third recruit. Your third recruit will form your first baseshop and you will get $35 for this recruit. What really separates EVP from MD is how you are able to earn on level 2. Not only will you be able to earn $35 for your personal recruits, but you also earn $25 for the people that they recruit in. This is where the MLM part of it starts to come into play. 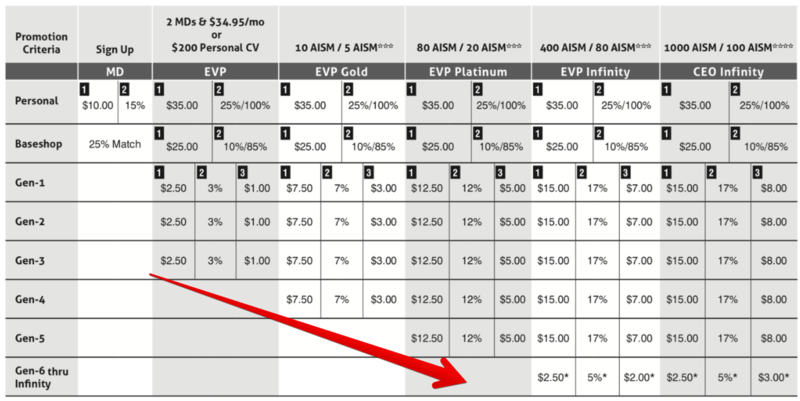 At the rank of EVP, you also earn higher retail commissions. Instead of earning 15% CV as you did it as a MD, you will earn 25% CV and will even have the ability to increase this the more you sell in specific time frames. You will also be able to earn from what are called "generations". When one of your recruits in your baseshop recruits into other people, they move up to the rank of EVP as well and they then form your first generation. At the EVP rank, you will be able to earn three generations deep, but there is much more to it than that. There are multiple higher ranks than EVP and by reaching these ranks you can increase your earnings down more generations, as I will discuss below. I think it is pretty obvious that the compensation plan is focused around recruitment. I do like how they have what they call the "super affiliate bonus", which is where you can increase your earnings by personally making more sales, but there is no doubt that the majority of the focus is placed on recruitment of other associates. After bringing in those first two recruits, the goal is to keep on recruiting people into your bakeshop, where you will earn $35 and their first two recruits will then bring you $25. Then of course the cycle will repeat itself as those people recruiting others and do the same thing you just it. And this is where Income Shift Pro comes into play… It helps you gather leads and recruit people into the system more easily. The table above shows the compensation plan for myEcon. This gives you a better idea of what you are looking at. As you can see there are multiple other ranks above EVP and as you move up the ranks, you will be able to earn commissions down more generations. I suppose failure is largely subjective. Maybe some people consider making an extra $200 a month a success, but many other people would consider that a failure. The bottom line is that if you don't recruit people in constantly, and take advantage of the recruitment-focused compensation plan, then you will probably fail… Or at the very least will find it much more difficult to make money. Okay... So now you know what myEcon it is and how you can make money from this business. But let's get back to Income Shift Pro now in talk about the big downside. The system is great for capturing leads, managing those leads and following up with them. This marketing system can definitely help you out and make things a whole lot easier when it comes to recruiting people in. HOWEVER… There is one piece of the puzzle missing, one important variable in the equation. How are you going to get those leads in the first place? 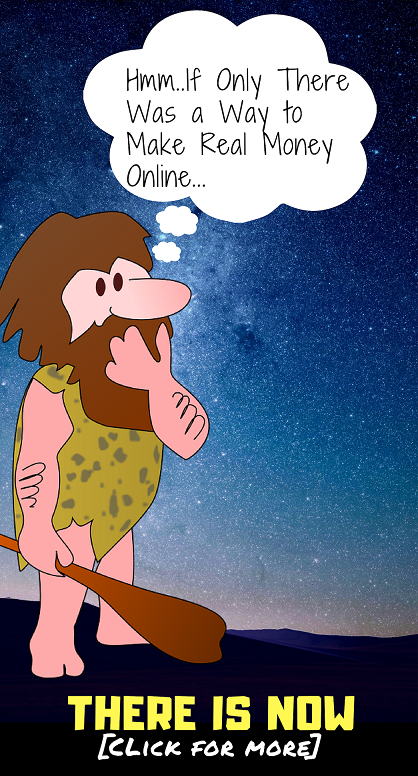 In order to get leads you are going to need traffic, but how are you going to get this traffic? As I explained earlier when I went over what all is included in the ISP membership area, there is definitely a lack of training. In fact… There is no training on traffic generation. And if you don't have any traffic being sent to your pre-made professional looking lead page, you are not going to be gathering any leads and you aren't going to be making any money. You can have the nicest system in the world, but with no traffic is going to be just that… A nice system that isn't making you any money. There it is somewhat of a solution, but not a very good one. The in the real training you can get for traffic generation comes from the private ISP Facebook group that you will be invited to join. The group appears to be very active in there is training provided on various aspects of online marketing, including getting traffic. In addition to this, you also can learn a lot from this Facebook group by seeing what others post and what is working for them, what is not, etc. The Facebook group can be a big help. I've been involved with other "systems" in the past, not this one, but I can tell you that being able to communicate directly with other members that are going through and working towards the same thing you are is a big help. To be honest, I am not a fan of MLM's and I definitely not a fan of myEcon since this company is mainly built for the MLM business opportunity and not so much focused on the products. I don't know if you are able to catch this, but MLM businesses are not exactly my cup of tea, and for good reasons that I will discuss soon. That said, since making money in this business is all about recruitment and ISP can help you with this, I think it is easily worth the $25 per month membership price. In fact, I think it could potentially be worth a lot more than that. The pre-made landing pages, the SMS and email autoresponder, and the ability to communicate with other people using the system through the private Facebook group, along with other things… I think that is definitely worth $25 per month. You may be wondering why the system is being sold for so cheap, and the answer is simple. The people that created ISP are part of myEcon. They want you, and others buying into the system, to recruit in as many people as possible because this also makes them more money due to the MLM structure in play. Maybe you won't, maybe you well, but there is no doubt that this work-at-home opportunity is often promoted in a rather deceptive way that makes it seem much better than it really is, which is commonplace in the online marketing world. In the very beginning of this review I said both Yes and No to whether or not I would recommend this system. The reason I said this is because I do not care for MLM's and I don't personally recommend them. That said, if you are all gung ho on getting involved with myEcon I definitely do think that ISP can help and is something worth getting involved in. There are so many MLM opportunities out there and they all have one thing in common… The majority of people that get involved with them end up failing miserably. Some people claim that 95% of people that get involved in MLM's fail. Now of course the statistic will vary greatly depending on which MLM opportunity you are talking about, but there is no doubt that the failure rates are very high. Well… It is the pyramid-like structure as I just mentioned that is the culprit. The more pyramid-like of a MLM structure that is in place, usually the higher the failure rate. This is because with a more pyramid-like structure, there is more focus placed on recruitment and less on product sales to the general public. All of this is explained in my post here. The problem with this all is that commissions flow from the bottom of the pyramid to the top. What this means is that those at the top are getting more money in those at the bottom are having potential earnings taking away from them. And as we all know, there are always more people at the bottom than there are at the top and there always will be… Which is why this business model actually makes it harder for most people to make money and is the reason that most people fail. The reason MLM's are so luring and so attractive is because they provide lots of growth potential. There are usually many ranks and lots of room to move up to earn more money, but of course most people will fail to ever do this. I couldn't find any official income disclosure for myEcon to prove my point here, which is suspicious by the way, but I have reviewed dozens of MLM's (Max International, Nucerity, etc) and know this is how things work. A good work-at-home alternative to MLM's is affiliate marketing, which is when you promote products online and earn commissions, but there is no need to recruit other people in. The reason I am bringing this up is because this is actually how I make a living working online and I know how lucrative it can be. If you want to get involved with affiliate marketing then there is no better place to start than the Wealthy Affiliate training program, which is where I got started back in 2015. The reason I recommend this place over others is because I know it works from my personal experience. Note: While affiliate marketing is a good alternative, and is one that I would personally recommend over MLM's without a doubt, there are still a lot of people that fail in this industry as well.